This couple chose Crescent Park in New Orleans for their engagement portrait on this beautiful October afternoon. Crescent Park, which opened in 2014, is located right along the Mississippi River, just to the east of the French Quarter. An interesting aspect of this park, which was converted to public space from its previous use as wharfs, is that the designers didn't simply bulldoze the entire space to wipe it clean and start fresh, but rather incorporated some of these industrial elements into the park, giving parts of a it a very cool gritty feel. 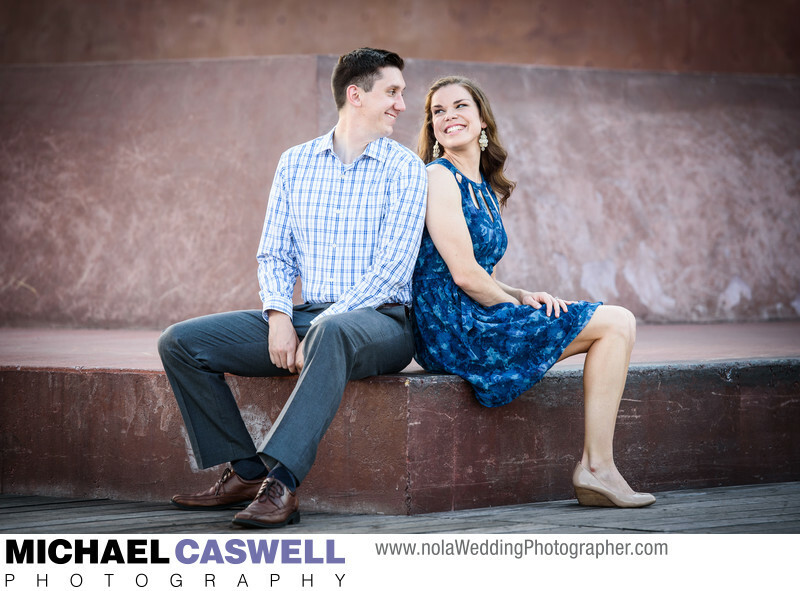 I'm not sure if this concrete structure the couple was sitting on was one of these repurposed elements, but the rusty metal wall with a grid of large rivets seen further behind them did appear to be, and we captured some great photographs there as well. There are also some nicely landscaped garden areas, as well as an interesting iron bridge that goes over the railroad tracks that run adjacent to the park. Location: 1008 N Peters St, New Orleans, LA 70117.